One of the great illustrator's masterpieces is exhibitedor is it? he Norman Rockwell Museum at Stockbridge, Massachusetts is my favorite museum. It uniquely presents the work of a single artist, and it accomplishes its mission brilliantly. It is a joyous place, set handsomely in the lush Berkshire Mountains. The place radiates the warmth, optimism and humor of the great artist it showcases. Tourist buses disgorge an endless stream of visitors, who wander through the galleries with genuine smiles on their faces. People have a good time at the Museum. Whatever your mood upon entering, the visitor to the Norman Rockwell Museum is invariably uplifted and charmed by the experience. The familiar paintings are presented in a world-class, highly professional manner by the skilled and experienced staff. Which makes the following story a genuine mystery. 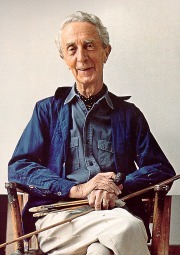 In the summer of 2003, the Museum mounted a handsome exhibition entitled Freedom: Norman Rockwell's Vermont Years, presenting the work of Norman Rockwell produced during the time he lived in Arlington, Vermont. This period (1939 - 1953) included many of the artist's greatest works, including the world-renowned Four Freedoms. 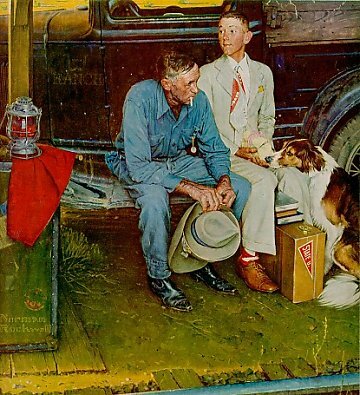 Many Rockwell fans recall the memorable painting Breaking Home Ties, which depicts a weathered rancher waiting at a rural railroad station to send his son away to college. 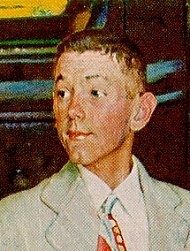 Image my puzzlement, when visiting the exhibition for the first time and confronting the large canvas labeled Breaking Home Ties, I realized at once that the painting before me was not by Norman Rockwell. Hanging there on the exhibition wall, bearing a Museum label announcing it as Norman Rockwell's Breaking Home Ties, was what appeared to me to be a third-rate replica of the original. Even a casual observer could see the difference, comparing the exhibited painting with the superb reproductions of the Rockwell original in the Museum shop immediately adjoining the gallery. What was going on here? What was a world-class museum doing showing an inferior replica, proclaiming it to be the original? Later on in the summer, a Museum bulletin insisted that the exhibited painting had been "recently restored," and was being exhibited for "the first time in forty years." As a devoted fan of the work of Norman Rockwell, and an avid enthusiast of the Norman Rockwell Museum, I immediately wrote the first of what would eventually be a total of seven letters to the Museum's administration, askingas a concerned Museum member and boosterfor clarification. How could the painting be termed a "restoration" when literally every square inch of the painting was entirely new. As of the date of this writing (February 2004) none of my letters have been answered. Twice I received notes from lower-level staffers, assuring me that my inquiries would be responded to by the Museum director. No such response has been forthcoming. at the Norman Rockwell Museum. Perhaps most puzzling of all is the fact that the Museum is distributing copies of the inferior replica to publications such as American Art Review, who reproduced it in their Fall 2003 edition. The Museum of course has reproductions available of the brilliant original. Why are they now publicizing the replica, even to the point of reproducing it in color on the cover of the Museum's annual report? Why is the Museum refusing to respond to scholarly inquiries? What is going on? 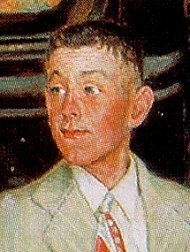 If the explanation is that Norman Rockwell's original of Breaking Home Ties was somehow badly damaged or deteriorated, requiring a total repainting, why is this not explained? Who is the artist responsible for the "restoration?" If the exhibited painting is a replica, where is the great original? Most of all, why does the Museum insist that this is the painting which appeared on the cover of the Saturday Evening Post, September 25, 1954which it most assuredly is not. The mystery at the Norman Rockwell Museum has been solved. On April 6, 2006, the New York Times, in a front-page story, announced that the original of Rockwells Breaking Home Ties had been discovered in an unoccupied house in Vermont, hidden behind a false wall. The original painting is in good condition, and has been placed on exhibit at the museum, alongside the fake. The entire story can be read on the museums website at www.nrm.org/page109. I can report that the museum very graciously contacted us at once, invited Elizabeth and me to visit the museum to see the newly-discovered painting, and to lunch with the museums director. Apparently, alone among the many who voiced opinions regarding the mystery (including a number of notable experts), this writer was the only commentator to remain firm in the contention that the painting on exhibit at the museum for nearly three years was a fake*. A very gracious and sincere apology was offered for the three years of ignoring my letters, an apology which was received with understanding and sympathy, given the extraordinary circumstances as described in the museums posted account. The only part of the museums account with which I must continue to take exception is the description of the fraudulent painting as an expertly crafted copy and astonishing. To our eye it does not seem either expert or astonishing. The astonishing part is that so many curators and experts grasped at so many explanations, including effects of time, severe climate changes, badly cleaned, etc., when in reality the painting on exhibit was a total, rather clumsy repainting. We are delighted that the brilliant original has been found and is on exhibit for all to enjoy. The incident is now closed.